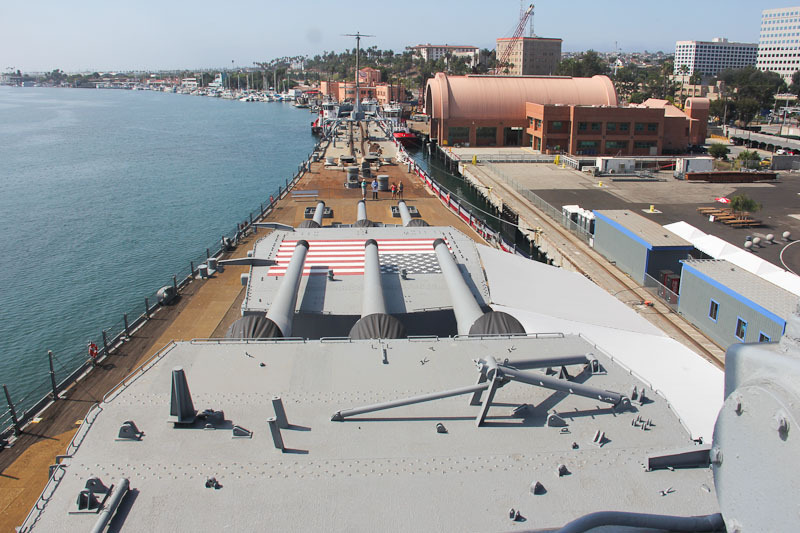 August 30, 2012 - Today's adventure brought us to San Pedro, CA to see the newly installed USS Iowa Museum. 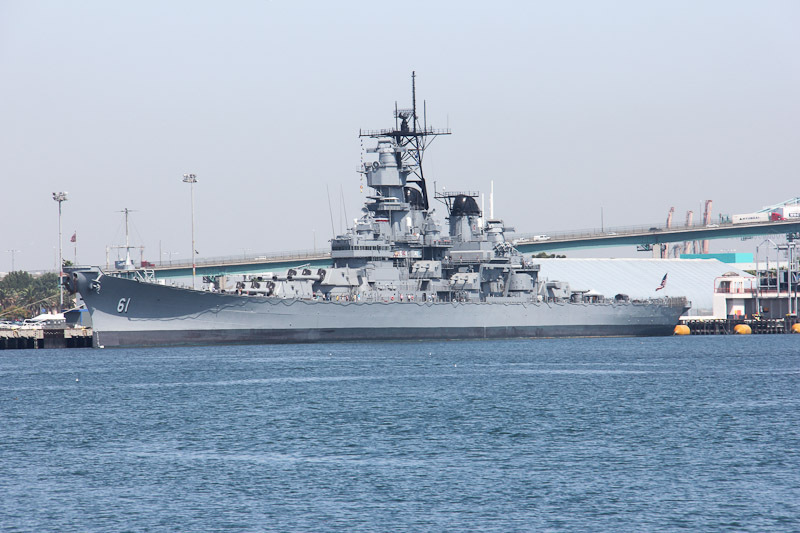 The USS Iowa, called the "Battleship of Presidents," was built in 1940, and served our country for over 50 years. Designated the "World's Greatest Naval Ship" due to her big guns, heavy armor, fast speed, longevity and modernization, she kept pace with technology for more than 50 years. She's a beauty! 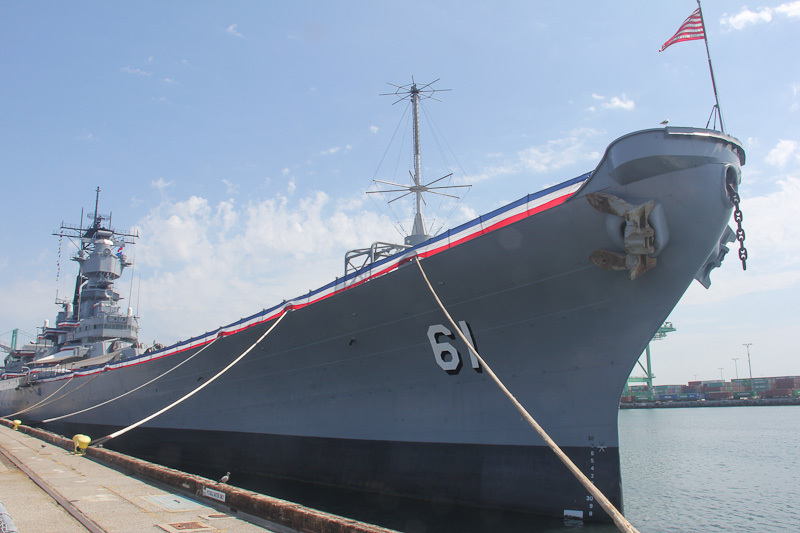 After her fifty years of service, she's found her new permanent home in San Pedro, CA. The Iowa's overall length is 887 feet. 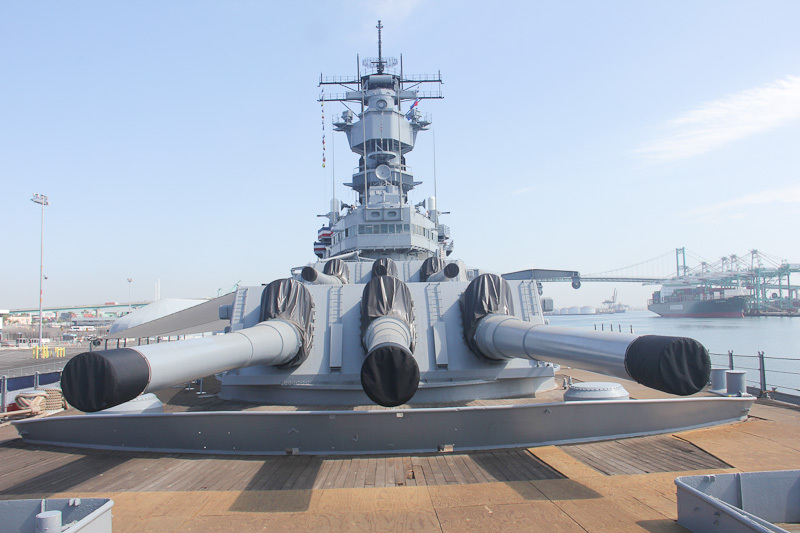 Her primary asset when built was the nine 16 inch, 50 caliber guns installed on the fore and aft decks. After World War II, the Iowa also saw service in the Korean War and during the Cold War and post-Cold War periods. Thirty-two Tomahawk missiles and sixteen Harpoon missile launchers were added during the post-Cold War period. This is a photo of all guns firing back in 1985. 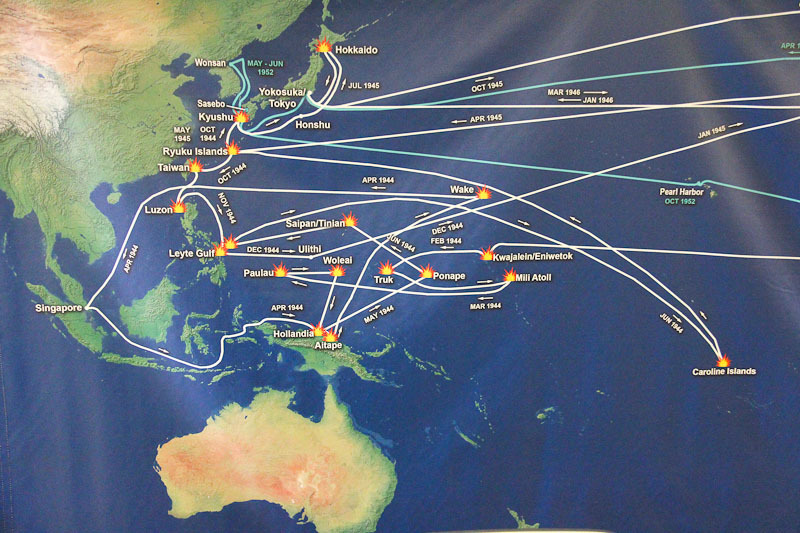 Most of the action seen occurred during World War II in the Pacific. Below is a map showing the locations of the various battles she was engaged in during that period. 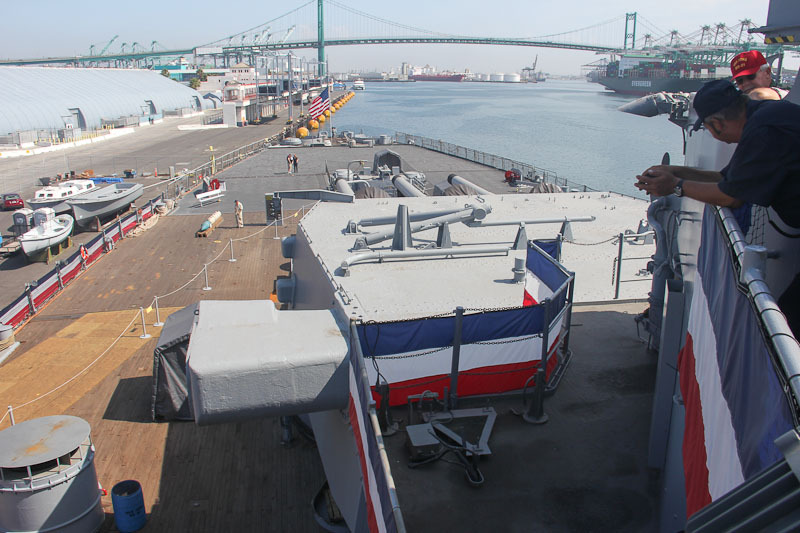 This view of the bow was taken from the bridge. 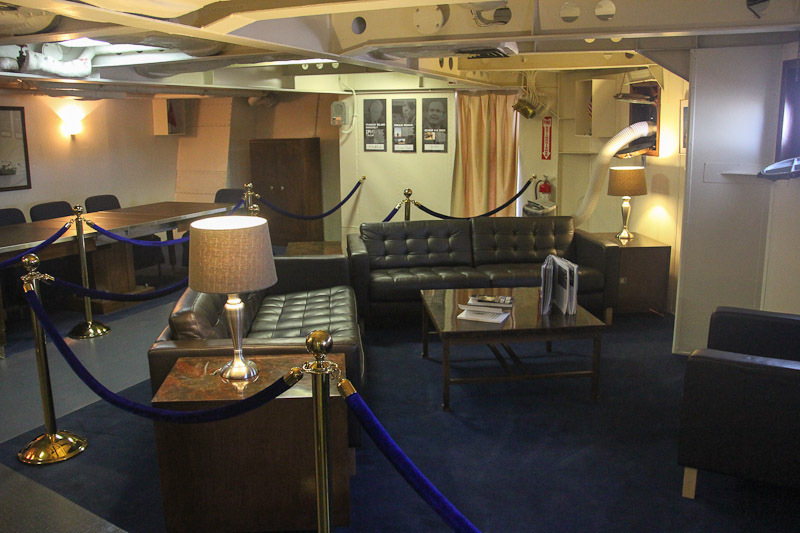 And this one shows the aft of the ship. 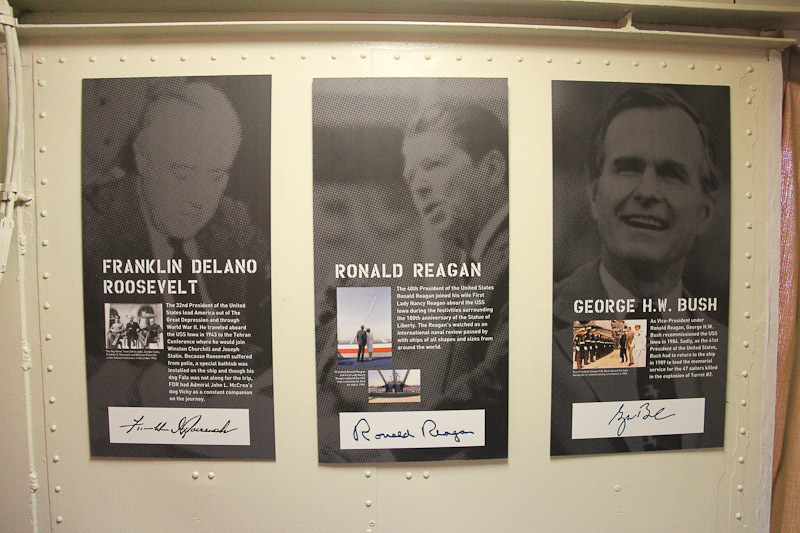 These are the three United States Presidents who sailed on the Iowa. This is the presidential suite including office, conference and lounge areas. 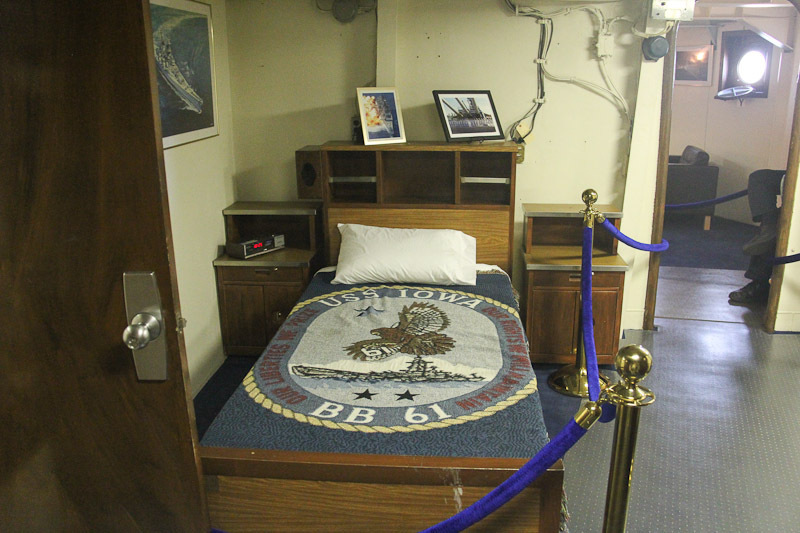 The presidents' bedroom was adjacent to the lounge. 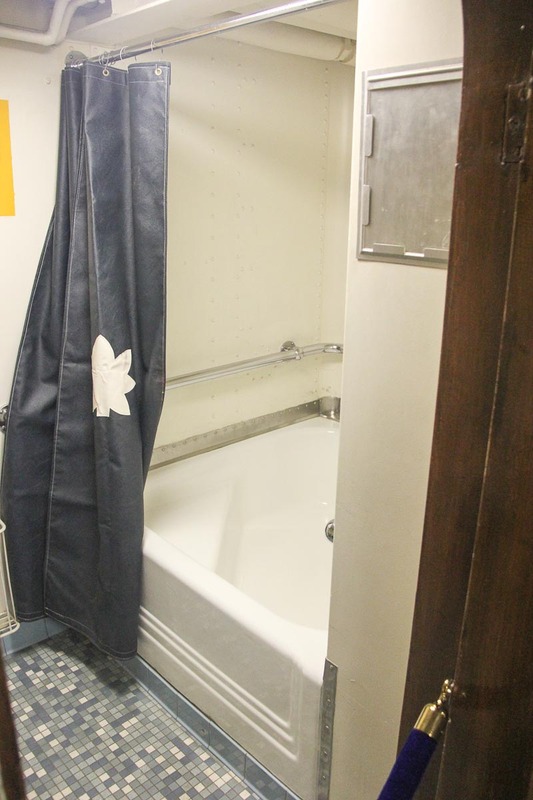 And this is the famous bathtub constructed for Roosevelt, which is the only bathtub ever installed on any naval vessel. 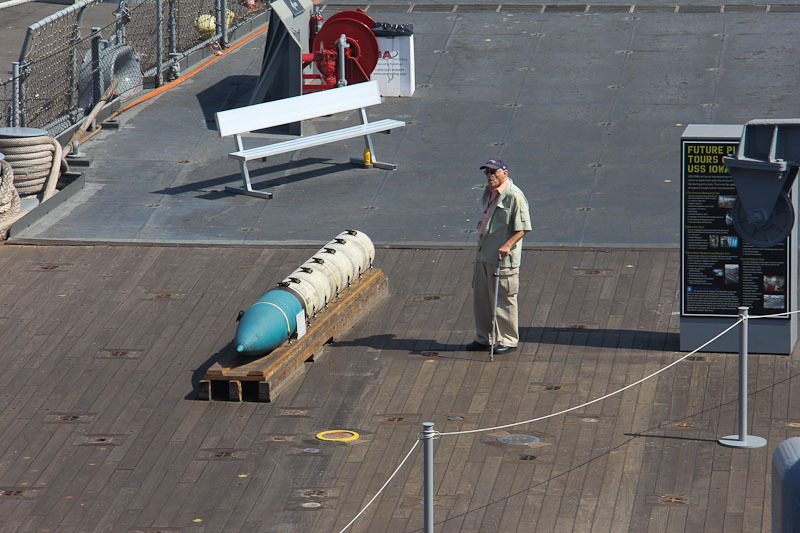 There were a lot of veterans touring the ship today and this one gentleman is inspecting the mock up of the 16 inch, 50 caliber projectile on the aft deck. 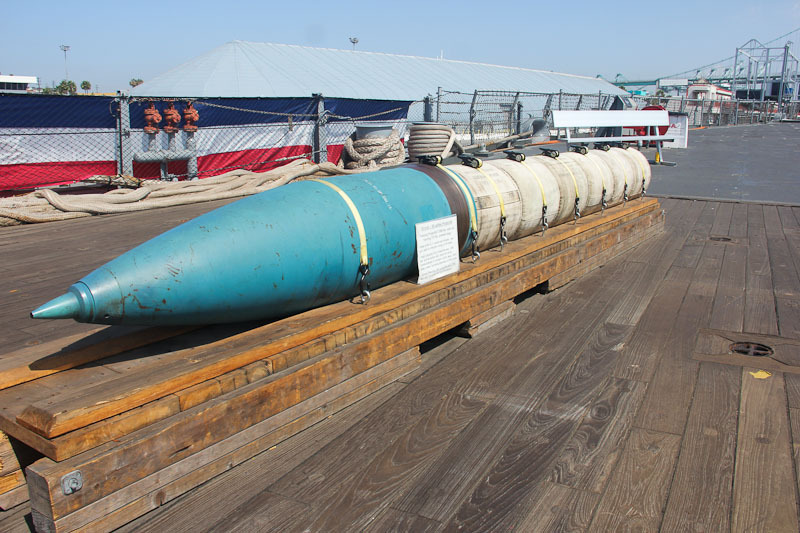 This projectile weighs 1,900 pounds and was fired after the six 110 pound powder cartridges were ignited. These projectiles successfully hit targets 26 miles away! 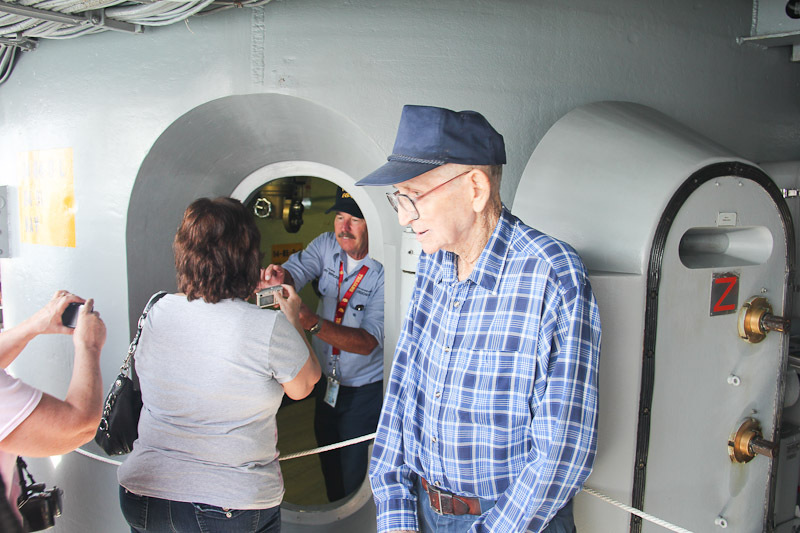 This World War II veteran is now standing outside the wheelhouse of the ship and he proudly told those of us around him that was where he used to work, and that his work was to drive this ship for five hour shifts every day. Notice the 18 inch thick steel walls and door of the wheelhouse. 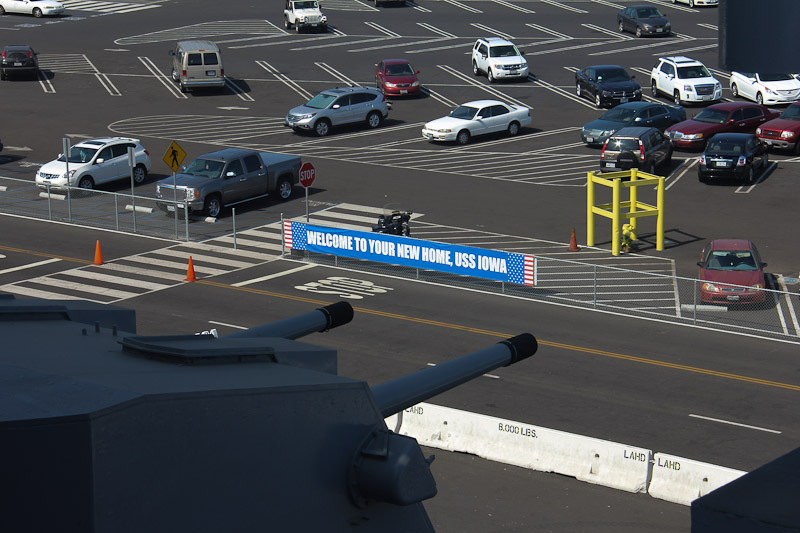 This same amount of armor protected the bridge while the sides of the ship has 12 inch thick steel armor plating. One of the veterans we met today told us that the gas mileage for the Iowa was 24 feet per gallon, or 220 gallons per mile! 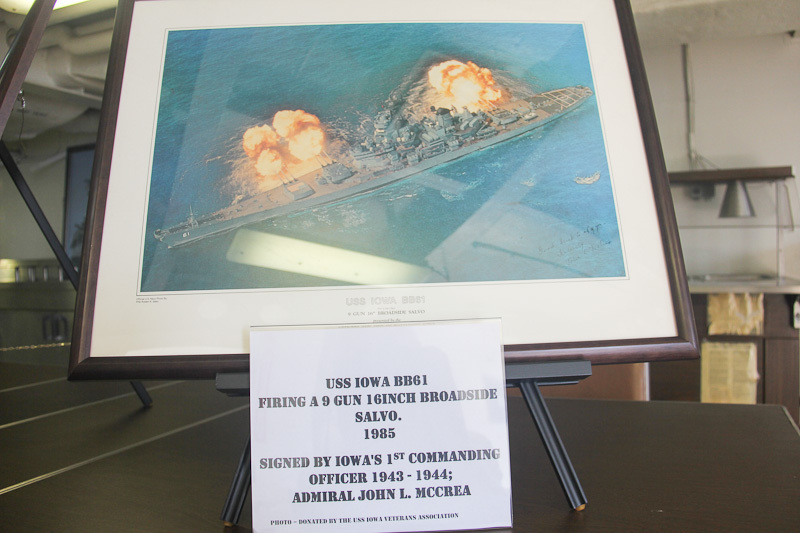 There were a lot of memories on board the USS Iowa today and we thank all veterans for their service.